When you create the right inbound marketing machine for your company, prospects are naturally drawn towards your content as they look for information around a topic relevant to a product you may be selling. 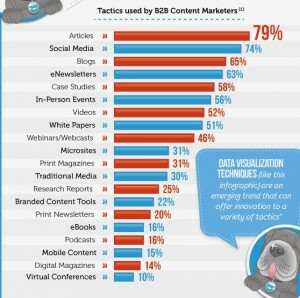 This is why inbound marketing is such a great strategy for companies who are just entering a new market. It helps you build relationships with potential prospects, start to generate traffic for your local site and let’s you know what content the market is interested in. Here are 5 key areas you need to consider when planning out your local inbound marketing strategy. 1. Local Search: It’s imperative that your company appears for relevant searches in the regional search engines your targeting. 78% of users conduct product research online so getting your local search strategy right will be key to capturing users in those early stages of information gathering. You will need to consider the structure of your local websites, will you choose sub domains, sub folders or local top-level domains? What will work best for your business? If you do a search for “Lead Generation” in Google.co.uk most of the top 10 results are from .co.uk domains. This could indicate a local top-level domain may work best for this segment. But really it’s going to be what works best for your business. Once you have decided on structure, you will need to build a local keyword map for your sites and enlist the help of local SEO agency to help build local links. 2. Regional Buyer Personas: Buyer personas allow you create a fictional representation of your customers and really help drive your content strategy. If you are expanding into new regional markets, then it’s likely you have already established buyer persona’s for your core country. In some cases these may translate across to your new market, but you should be prepared to tweak these as required. For example, my understanding of “Marketing Automation” differs slightly from US to UK and again from UK to both France and Germany. Looking at data like what search terms brought them to your site, what content they viewed, what content they downloaded and what forms they complete, can give you a better understanding of your buyer personas in each region we target. This in turn helps you deliver a regional content strategy tailored to their needs. Make sure you have a local content strategy aimed at your prospects and customers in those regions. 4. Influencer Marketing: Influencer marketing should be part of any inbound marketing strategy you adopt. When entering new markets it’s important to look for regional experts who you can start to engage with. This may be a difficult task to begin with, especially if you are entering a region that speaks a different language, so it’s often a good idea to work with a local agency so you can start to identify these people. Once you have built up a list of influencers in your market, look for opportunities to include them in your eBooks, videos, interviews and webinars. It’s also important you don’t constantly ask of your influencers, but instead ask what you can do for them. For example, if they have a book coming out, ask would they like to promote it to your audience by way of an interview. This will lead to far better relationships in the long term. Also keep in mind, when choosing what influencers to build a relationships with, it should be based on who fits best for both your audiences, not who has the biggest klout score. If you are expanding into countries that speak different languages then you might consider setting up a Twitter and Facebook page for each new language. 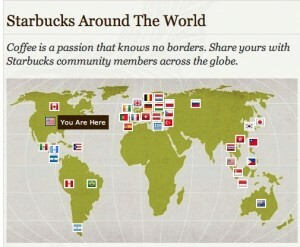 Here is a great example from Starbucks Facebook page where they let you pick between their different country pages. 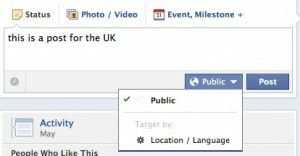 I hope this article helps you directing more local traffic to your website. If you’d like to learn more about how I can assist you further with SEO optimization, just contact me.